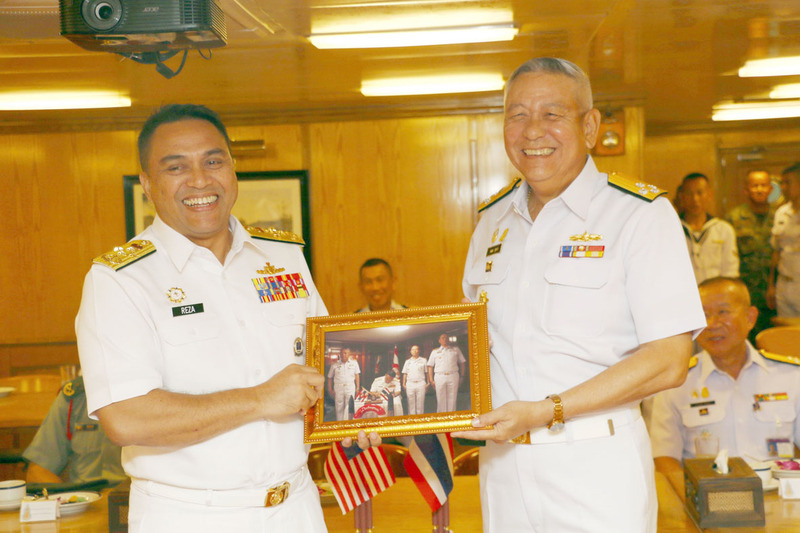 Adm. Noppadol Supakorn (right), Commander-in-Chief of the Royal Thai Fleet representing the Commander-In-Chief of Royal Thai Navy, welcomes Adm. Datuk Mohd Reza Bin Mohd Sany, Commander-In-Chief of the Malaysian Navy. Malaysia’s naval chief reinforced ties with the Royal Thai Navy during a visit to the Sattahip Naval Base. Royal Thai Fleet commander Adm. Noppadol Supakorn greeted Adm. Datuk Mohd Reza Bin Mohd Sany onboard the HTMS Chakri Naruebet. The Thai navy honored the Malaysian Navy commander-in-chief with a 19-gun-salute from the HTMS Rattanakosin. The two commanders discussed naval cooperation and joint exercises after which gifts were bestowed and signature books signed. Sany then was given a tour of Thailand’s only aircraft carrier.